This is the City. It’s a busy area, not really a quiet residential-only area. There are residents here and non-residents. Most are well-intentioned, but some are not. So what can you do? For yourself, first be aware when you are out, not distracted. When leaving your car, lock it and don’t leave items visible through the windows. Close and lock windows and doors at home. 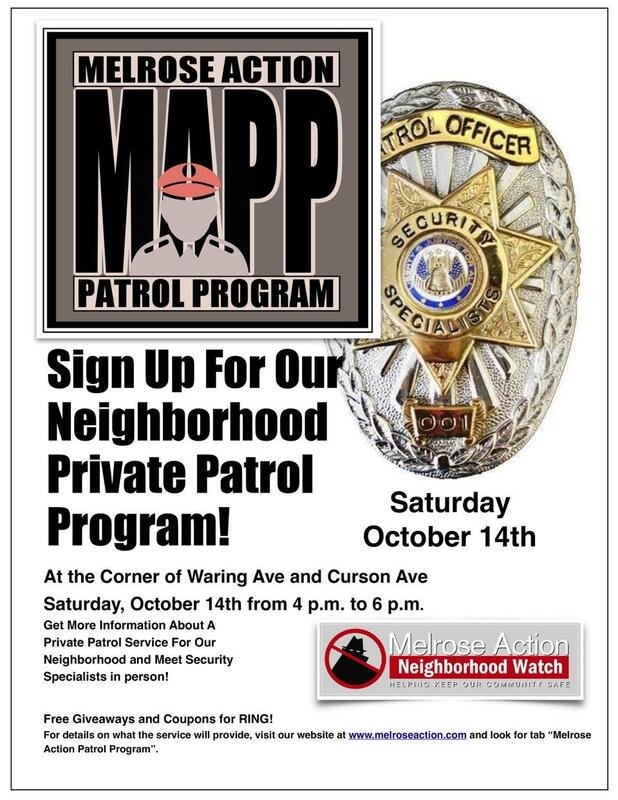 4 p.m. to 6 p.m. at the comer of Waring Ave. and Curson Ave.
An article in last Thursday’s Park LaBrea News | Beverly Press looks at recent crime in our area and what Melrose Action is doing, including MAPP. Also, Melrose Action’s next Meeting on Crime & Public Safety — Wednesday evening, October 18th at Blu Jam Café — will include a look at MAPP.